Here’s another example of shifting healthcare strategies. I just read this article today on drugstorenews.com – RB, Walmart and Doctor on Demand partner on promotion. The three organizations have teamed up to make healthcare easier to access for mass market consumers. This Fall, Walmart shoppers who buy RB brands such as Mucinex, Delsym, Airborne or Digestive Advantage online or in-store will receive a limited-time offer for a no-cost Doctor on Demand consultation. Speaking of making healthcare more accessible (as well as improving the patient experience), just yesterday this article appeared on beckershospitalreview.com – Walmart looks to add health clinics in its parking lots. For the broad cross-section of health care consumers who shop and trust the Walmart brand, this is a natural on-ramp to further the relationship. In today’s healthcare arena, the consumer is squarely at the center of health care delivery. It’s an arena that is more convenient, easier to use and less expensive. And it comes at a time when increasing numbers of consumers are taking on more responsibility for paying for their health care as the burden of costs is being shifted to them. For hospital marketing teams, this is either a daunting time or a very exciting time filled with new possibilities. But your perspective is probably shaped by how wide a lens you have into the world around you (actually not “you” – but your perspective customers). 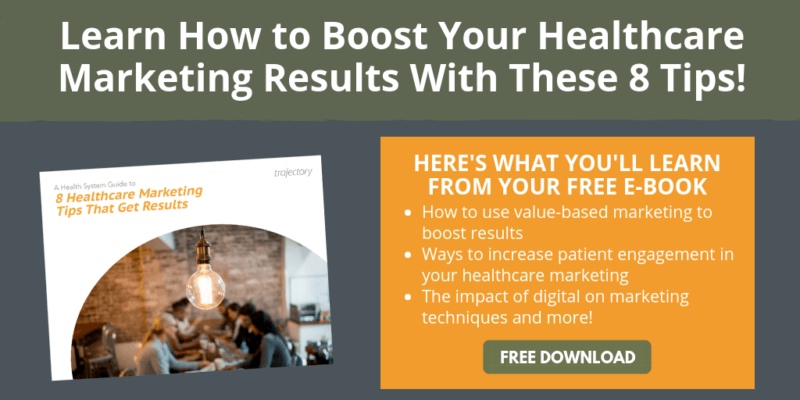 And relative to brands like Walmart, CVS, Amazon and Apple – who have changed the healthcare playing field – you likely have some catching up to do in terms of having a holistic view of your consumer. 1. Be inspired by the insurgents. The new guys on the healthcare block have fired a warning shot to your health system or hospital. Presumedly, you’re not going to be complacent and simply cede your territory. Re-focus on consumer insight, double down on improving patient engagement, improving access and improving patient experience. 2. Be more agile. Across categories, it’s the number one challenge for established brands seeking to fight back against faster insurgents. You know that list of 10-15 unused ideas you have sitting in your drawer – now is the time to review them with a fresh eye, because there are probably a few that could qualify as potential ‘experiments’. 3. Aggressively pursue growth closer to the core. Going back to what you made you famous and invaluable, there are likely smart and more profitable opportunities closer to home. Take a cue from consumer products companies – driving penetration levels to grow your brand is the best way to grow. Since 1999, Trajectory has combined healthcare industry expertise with fresh perspective to help its clients win. Reach out to our healthcare marketing agency for a conversation.